Oh, my goodness. It has been two months since I promised you a Wobbly Circles Blanket pattern. Two months. It stuns me that my life is so busy! You may not know this, but I am a teacher. In addition to that, I am an assistant director for our summer school program. As soon as the school year ends, I'm getting summer school up and running. Add to that all of the excitement two 8-year olds require and I hardly have time to breathe. I know many of you are in the same boat. The good news is that I had time this weekend to translate my written pattern into an actual blanket! So far, we've made a Wobbly Squares Blanket and a Wobbly Rectangles Blanket. 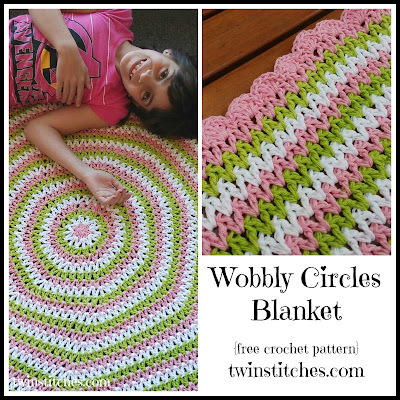 This pattern is for the Wobbly Circles Blanket. 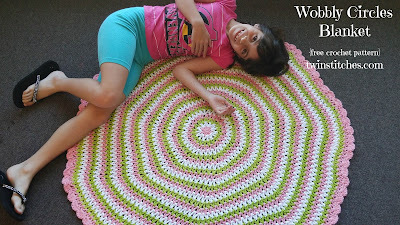 The ironic thing is that as I made this blanket, the larger the circles got, the less they looked like circles and more like a seven sided shape. The placement of the increases spirals out, but they are still discernible. By the way, if you are like me and are dying to know what a seven sided shape is called, look no further! A seven sided shape is called a heptagon. You've learned something new today! 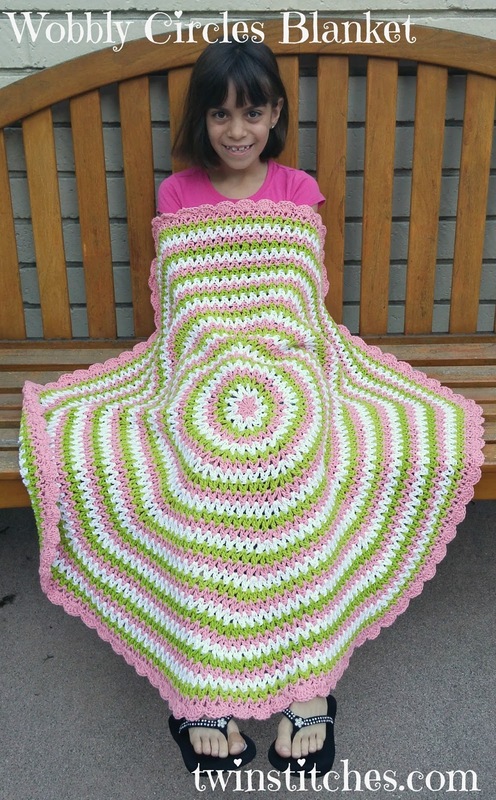 I did something I haven't done before with this blanket: I crocheted it entirely in cotton yarn. I had a ton of Peaches & Creme yarn that I had not used and decided to see what it would do as a blanket. I was a little anxious. I've generally only used this yarn for water bottle covers, mug hugs, and Kindle covers. I just did not see it as a blanket. I was pleasantly surprised! This blanket is so light and lovely. Completed blanket is 40 inches across. Row 1 (Pink): Start with a Magic Circle. Chain 4 (counts as 1 DC and 1 chain). *Dc2tog, chain 1* six times in the magic circle. DC and join to the third chain of the beginning chain 4. You will have seven chain 1 spaces. Fasten off and weave in ends. Weave as you go! You'll thank me later! Row 2 (White): In this round we are going to crochet an Increase Wobbly V-stitch in each chain 1 space. Remember that because we are doing the wobbly v-stitches, half of the v will begin in a chain 1 space and end in the next. Row 3 (Green): In this round, we will alternate Increase Wobbly V-Stitch in one chain 1 space and Regular Wobbly V-Stitch in the next. With a new color, begin a standing dc2tog in the left chain 1 space of any of the Increase Wobbly V-Stitches. It is important to the way we will be increasing that you start here. Since the increase looks like a W, you will start in the left opening of the W. Complete your dc2tog in the next space. *In the same space, chain 1, dc, chain 1, start the next dc2tog. Complete the dc2tog in the next space. Chain 1, begin the next dc2tog in the same space, complete in the next chain 1 space. * Repeat from * to * around. (You should have alternating increases and regular wobbly Vs in each chain 1 space around.) Chain 1 and join to the top of the first dc2tog. Fasten off and weave in ends. Row 4 (Pink): In this round we will follow this pattern: Increase wobbly, regular wobbly, regular wobbly. With a new color, begin a standing dc2tog in the chain 1 space to the right of any Increase Wobbly from row 3 and complete in the next space. *In the same space, chain 1, dc, chain 1, start the next dc2tog. Complete the dc2tog in the next space. Chain 1, begin the next dc2tog in the same space, complete in the next chain 1 space. Chain 1, begin the next dc2tog in the same space, complete in the next chain 1 space. * Repeat from * to * around. Chain 1, and join to the top of the first dc2tog. Fasten off and weave in ends. Row 5 (White): Again, remember to begin a standing dc2tog in the chain 1 space to the right of any Increase Wobbly from row 4. Then, continuing the pattern of increase, regular, regular, regular around. Chain 1 and join to the top of the first dc2tog. 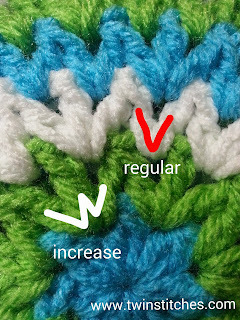 Remember, increases will always go in the first chain 1 space of any W. All the rest are regular wobbly V-stitches. Row 6 (Green): From here out, you will continue by starting the first dc2tog in the chain 1 space to the right of an Increase Wobbly V-Stitch, increasing in the first chain 1 of the increase in the row before, Regular Wobbly V-Stitches in the rest of the chain 1 spaces. Increase, regular 4 times. Repeat. Row 7 (Pink): Increase, regular 5 times. Repeat. Row 8 (White): Increase, regular 6 times. Repeat. Rows 9-27: Continue alternating colors each row following the pattern. Row 28 (Pink): No increases in this round. 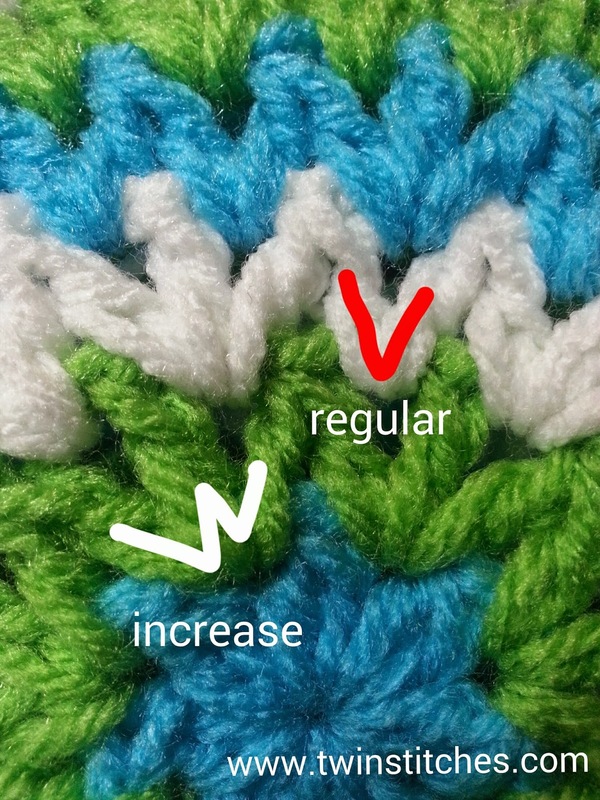 Regular Wobbly V-Stitches in each chain 1 space around. If you are going to use the same color like I did, slip stitch to the top of the first dc2tog and slip stitch into the next chain 1 space. 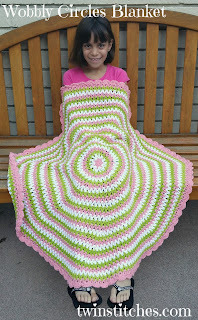 Row 29 (Pink): I used a scallop border for my blanket and I love it! It is easy to do and is completed entirely in the chain 1 spaces from Row 28. In the chain 1 space from row 28, chain 1, 1 sc in the same space. In the next chain 1 space, 5 dcs. *In the next chain 1 space, 1 sc. In the next chain 1 space, 5 dcs. * Repeat from * to * around, ending with a slip stitch in the first sc. Fasten off and weave in ends. 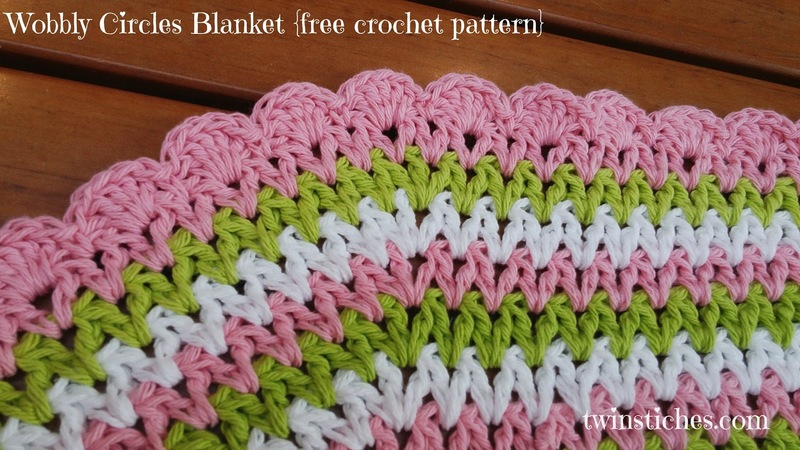 To make your blanket larger, continue from row 27 with the increase/regular pattern. 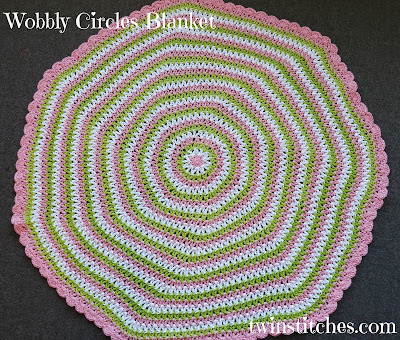 When you have reached the diameter you desire, crochet one row of Regular Wobbly V-Stitches and finish with the border you desire.